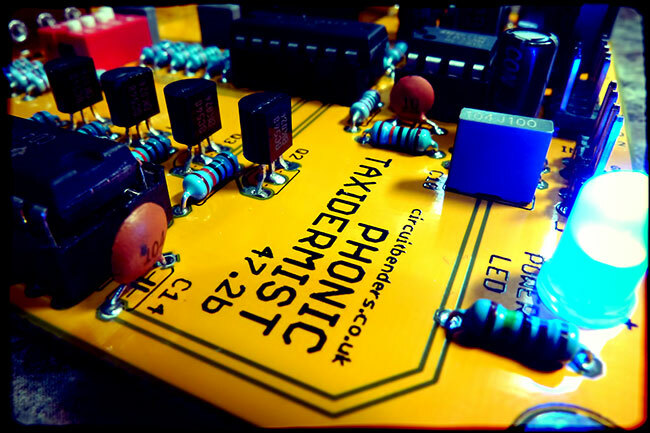 The Phonic Taxidermist 47.2b consists of two main parts, a grungy 10 bit digital delay based around a HT8955A 'Voice Echo' chip, and a high speed audio chopper that strobes incoming audio on and off at four separate frequency bands. Each frequency band can be activated individually or simultaneously with others, and the overall rate of the chopping effect is controlled by the frequency knob. The chopping circuit produces effects that sounds similar to a kind of nasty cross modulation or filthy frequency based distortion. It can be used to produce unearthly 'Radiophonic Workshop' type tones from pitched sounds, similar to what you might hear on Forbidden Planet, or an old episode of Dr Who. 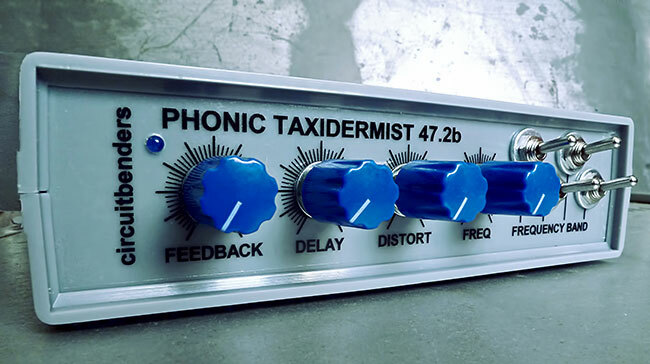 Percussive sounds can be hideously mangled in a manner not unlike a ring modulator thats actually useful, instead of just being that weird effect you mess around with every now and then but never actually use on anything! Its also very useful for emulating that weird crunchy aliasing noise ringing effect you get on very low bit rate samples. According to the original Voice Vandal promotional material 'You can now imitate The Daleks, Chewbakka, et al, without straining your voice', and yes, they do spell it as Chewbakka. Obviously even Maplin were somewhat wary of the notoriously litigious George Lucas! The board measures 100mm wide by 92mm deep, with the four pots mounted on the front 100mm edge. This should easily fit in a eurorack module, unless you have a very shallow case. The pots could easily be mounted away from the board in something like a pedal if you prefer. On the back edge theres separate mic and line level inputs and outputs, along with a space for an optional eurorack 10 pin power connector. You will probably want to bring the four switches for the individual frequency bands out to a front panel as well. You can download the build guide and parts list HERE. All the parts are easy to get hold of, apart from the HT8955A and its associated RAM chip. 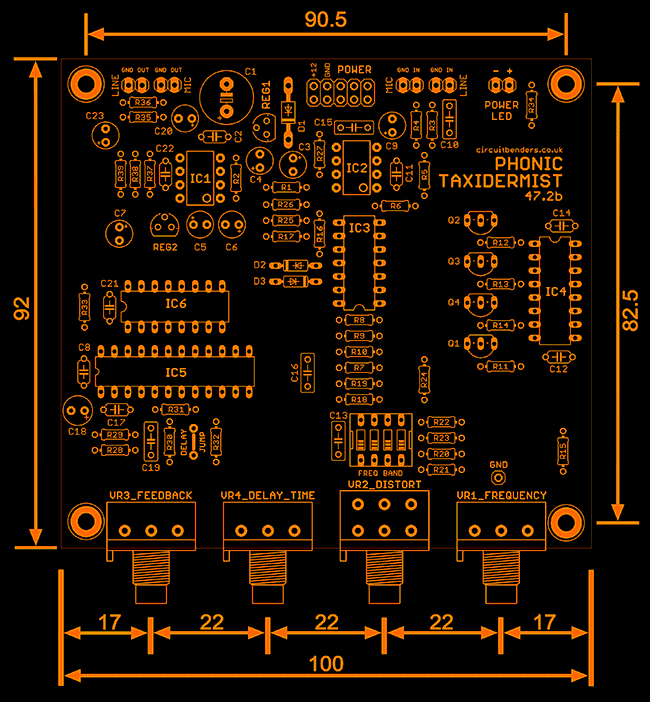 We will sometimes have PCB and IC bundles available below, if we've managed to get hold of some working IC's. If not then these IC's can usually be bought from an obsolete components or guitar DIY site locally, or a whole lot cheaper via a Chinese seller if you want to wait a while and take the very real risk of being sent a suspect fake or refurbished HT8955A IC. See the section below for more information on sourcing a HT8955A. 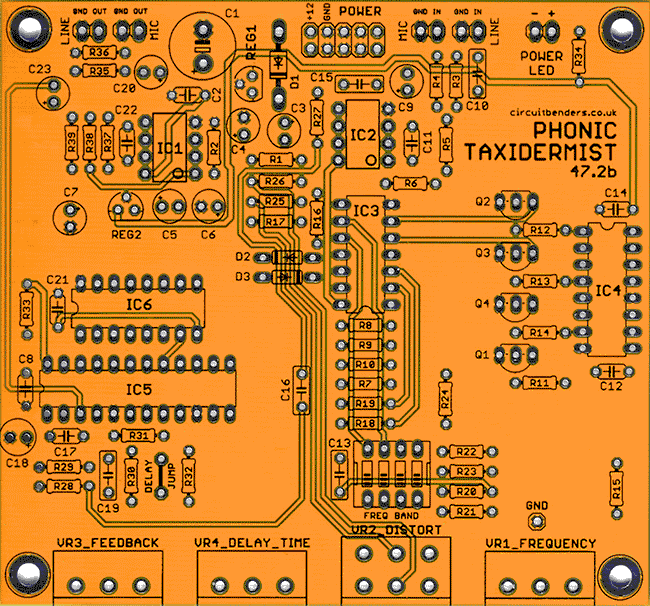 You can watch demo videos of this board below. The first shows the board built into a desktop case, the second is the first prototype board, and the third is someone elses video of an original Voice Vandal that they've built into a modular system. 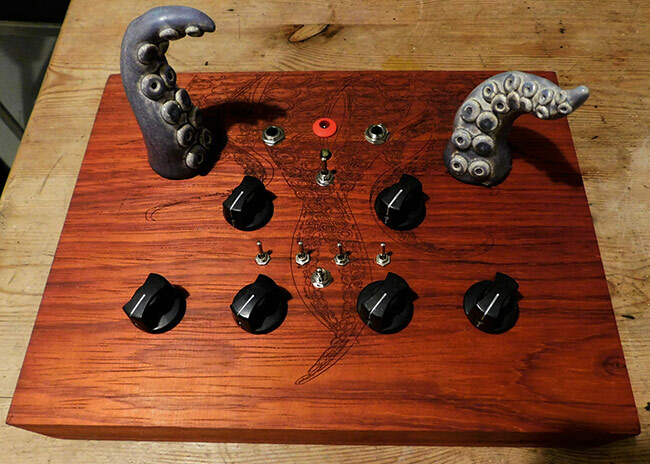 There currently a thread on the MUFFWIGGLER forum where you can see some other Phonic taxidermist 47.2b builds and join in discussion on building modular panels and mods etc. Click HERE to take a look. If you're making your own panel, the dimensions are shown in the image below. 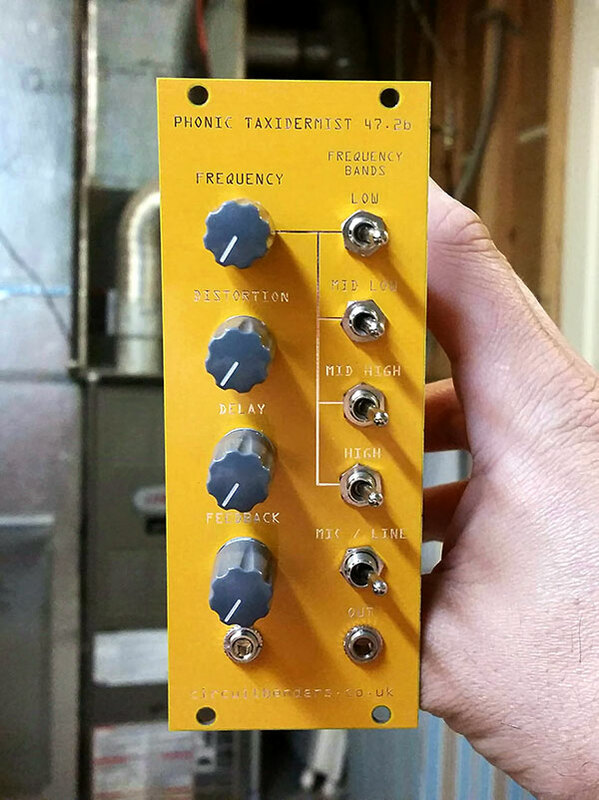 A Phnoic Taxidermist 47.2b PCB built into a 1/3rd rack unit enclosure. 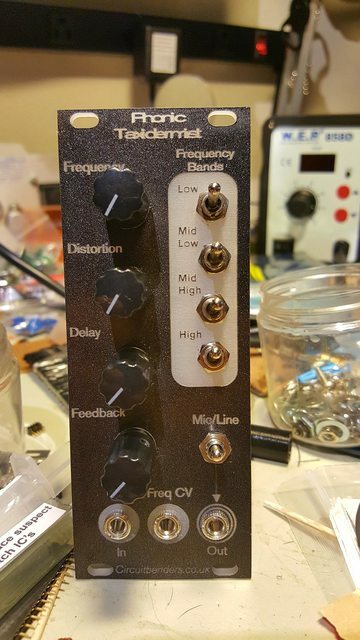 Another eurorack version built by user 'Barcode' on the muffwigglers forum. 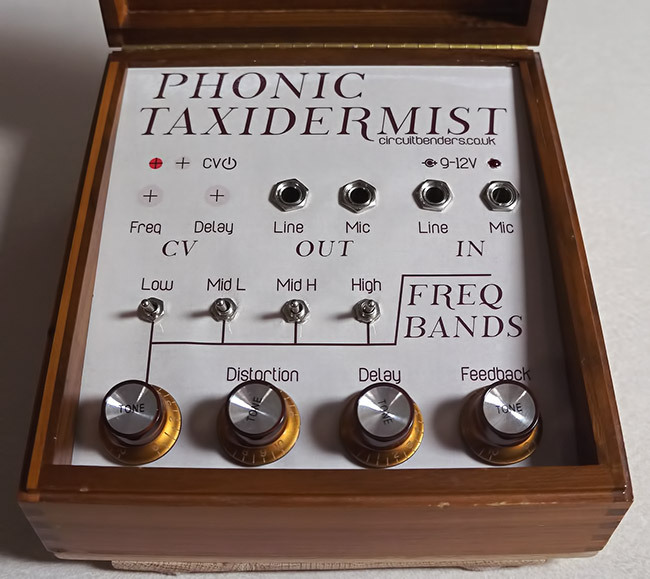 A Phonic Taxidermist 47.2b in a desktop case with a control voltage driving the frequency knob via a Vactrol. 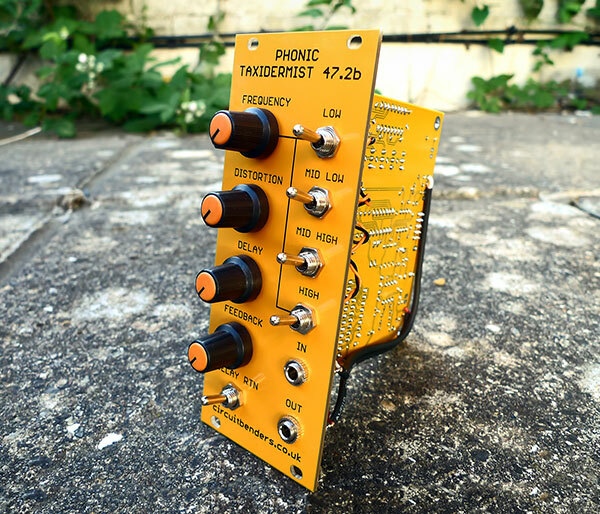 Phonic Taxidermist 47.2b modified with external gate inputs to switch in and out the four different frequency bands of the chopper circuit. A1970's style Phonic Taxidermist in a wooden case. Built by VOKS. If you are only wanting one or two HT8955A's IC's, and we don't have any PCB and IC bundles available, then we would recommend that you pay a little more and purchase a chip locally from a trusted supplier, as opposed to a suspiciously cheap Chinese source such as on ebay and Aliexpress. We have had a nightmare trying to source a reliable supply of these chips. 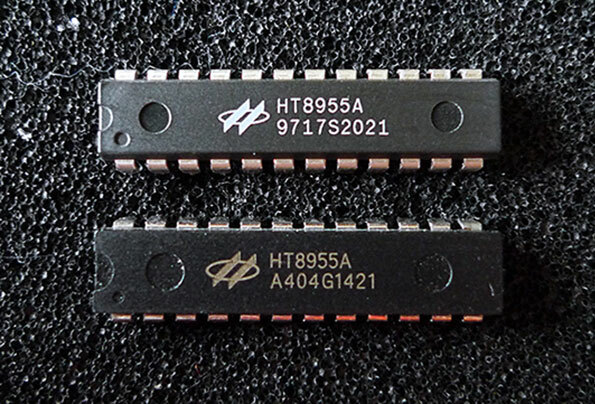 According to Holtek, the manufacturers of the HT8955A, their last production run was in 2004-2005, and the vast majority of genuine chips will have a late 90's date code. Mysteriously it seems that most HT8955A's that can be bought from Chinese sources have date codes from 2011, 2014 or 2015. This suggests that most Chinese HT8955A's are more modern fakes possibly produced with very worn tooling, or more likely either something else entirely or refurbished parts that have been 'blacktopped' and reprinted. Theres an excellent article on spotting fake and refurbished parts that explains 'blacktopping' on the AERI site HERE. The big problem here is that sometimes a Chinese HT8955A will work perfectly, and sometimes they either distort horribly, are completely dead, or have issues with far too much delay feedback. The video below shows the difference between a working HT8955A with a 1427C code, and one of 100 chips we had with A404G1421 codes that were ALL faulty. 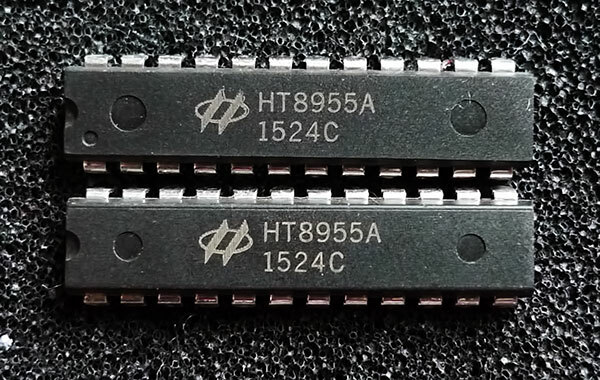 Both of these HT8955A's were supposedly produced in 2014, so neither were actually what they say they are, but one works properly and the other doesn't. Buying a modern Chinese HT8955A is pretty much pot luck as to whether it'll work or not. Whole batches seem to be either junk or work perfectly, although even within batches there are some very dubious tricks going on. Both the chips labelled 1524C below are supposedly from the same batch, and yet have obvious differences such as the indentation showing pin 1 on the top chip. This is impossible as no manufacturing plant changes the design of an IC casing halfway through the batch. Original HT8955A's from the 90's had white print, like the genuine one with the 1997 date code thats on the top in the image below, and like the ones that Chinese sellers invariably display in their photos on ebay and aliexpress listings. The bottom one is a blatantly refurbished piece of junk, as all HT8955A's with batch codes starting A404 seem to be. Basically, you can either save a few pounds or dollars and take the chance that your Chinese chips just won't work, or pay a bit more and buy from a trusted supplier.